I found myself drawn to brighter colors today. Maybe I need a touch of Spring. Because, this is what I'm seeing outside right now. My autumn joy looks like cotton balls. I painted a couple frames in shades of blue. 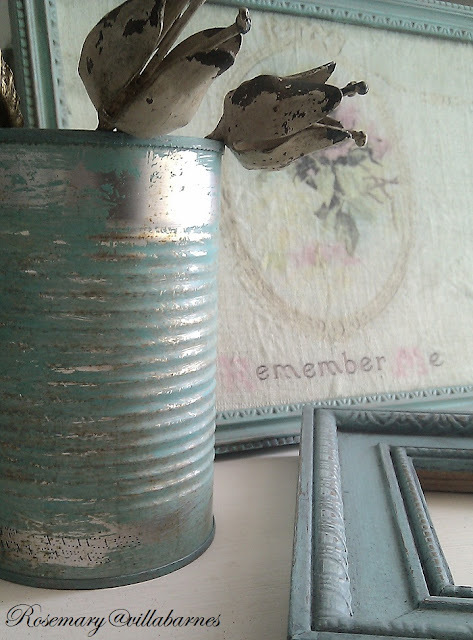 Why not add a little color to a tin can too. 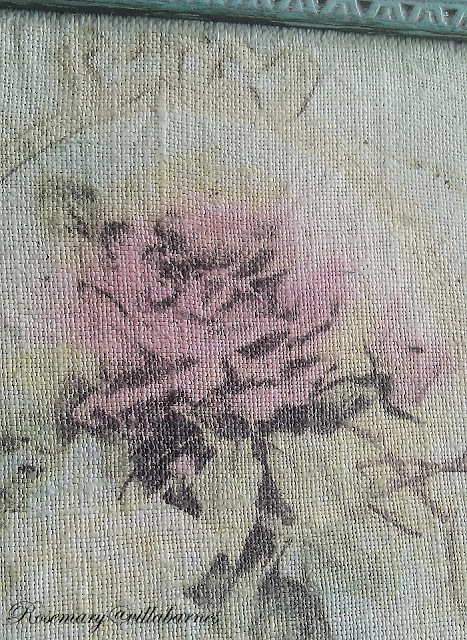 My casual piece of art is an old postcard image I printed onto muslin (Click HERE to see how I did it). I gave it a slight bluish tint. I also wanted it to fade. Although you can use dye, I just dunked the material in watered down acrylic paint. I rinsed it a bit, wrung it out, and let it dry. I left the wrinkles, and glued it to a piece of board. The frame color compliments it. Just looked out the window, and we're really getting slammed. It's suppose to continue for hours, and hours, and........Ready for Spring. How about you? 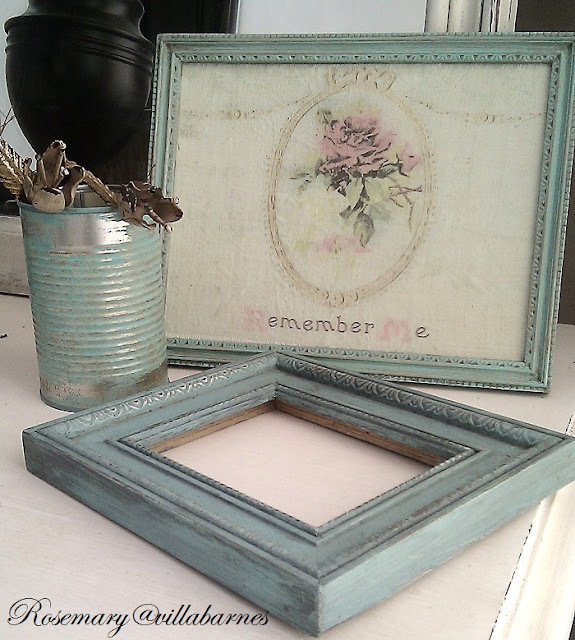 Oh my gosh, Rosemary.....THIS piece is speakin' to my shabby chic heart!!!! It's just BEAUTIFUL!!! ♥ Would you consider creating one for me and leaving it unframed? I'd like to glue it on a stretched canvas frame. Let me know if you would do this for me and how much you would charge. This is gorgeous!! Great job as always. 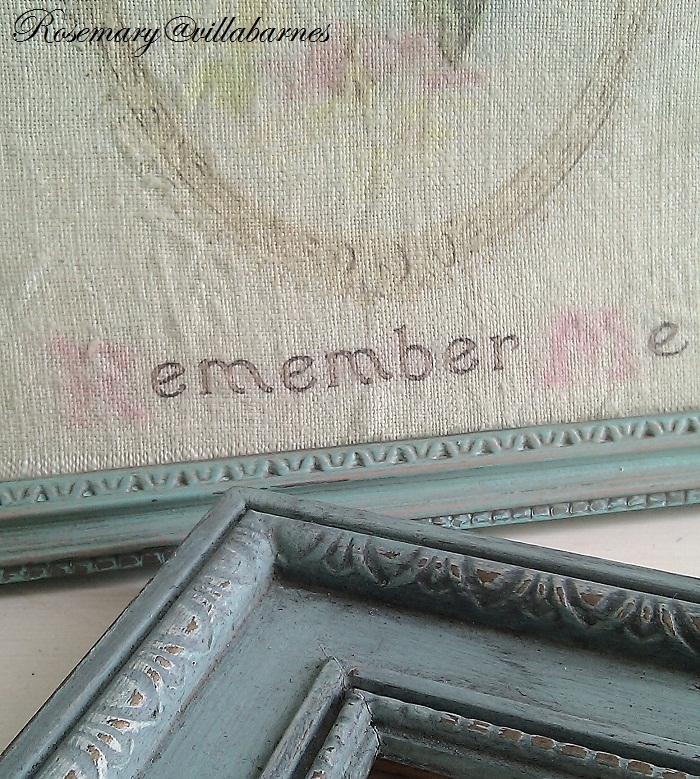 Pretty frame Rosemary and that graphic too! Ahh yes we in that same storm you have.Yes we are all ready for spring! That is really lovely, Rosemary! Love seeing your snow pictures so I can see what I'll be getting tonight into tomorrow. : ) It is supposed to be in the 50's in a couple of days, so it won't be around long anyway. Gorgeous, Rosemary! You're so talented and have such a wonderful eye for this! Send a little snow to Georgia, please! I love it! So pretty and such a unique technique! Stay warm, Spring will be here soon!!! Oh my, that's a lot of snow! We're waiting to get slammed tomorrow night. 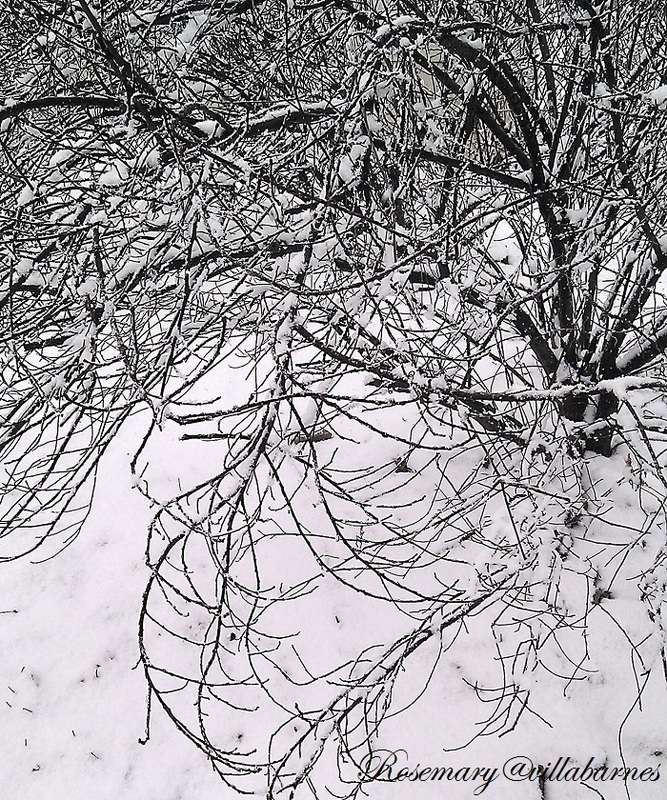 I'm with you: come on spring! Love your pieces. We just finished digging out...we had a least 12". Our poor little cocker spaniel can't even get out into the yard, it's way deeper than her. Our neighbors must think we are nuts, out digging paths all over the yard...LOL! Your beauties make me yearn for Spring!! Lovely! Love that shade of blue! So happy we are just to get rain as much as I love the snow. Stay warm! Your soft blues are very pretty. I am ready for and and warmth. We have no snow of course but I dislike cold of any kind. I LOVE your framed piece...it looks really old. I thought you'd been thrifting! Thanks for sharing how you do things. I love the blue! We're suppose to get snow on Thursday! I love the winter but I'm soooooo ready for spring! 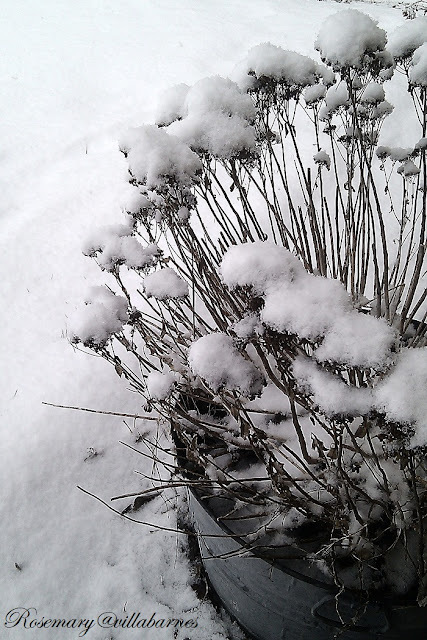 It is so very beautiful...the "quiet snow"....but you have had enough!...Glad you are focusing on your beautiful Spring creations on this wintery day! !...Stay warm Rosemary!! Although we didn't get any snow, I am with ya- bring on spring. Your pieces are lovely. The perfect project to cure the winter blues. Oh so beautiful Rosemary. We're supposed to get snow and sleet for the next two days. I'm more than ready for spring! I think you have more snow than I do. I'm getting a bit "shacky wacky" and those blues are certainly drawing me in! Very pretty and really DOES look vintage! Great job! Ohhhh that is gorgeous Rosemary!!! I'm going to check out your technique for this, although I'd never attempt it because it wouldn't turn out as beautiful as yours! The snow does look really pretty! Love it. That process is a winner every time you use it. How pretty Rosemary! Aren't you ready for winter to take a break! We even to snow as far down the state as Olney today! UGH! To happy spring days, maybe this weekend! Rosemary, I've been a huge fan of yours for a long time. Your ability to transform a piece is unsurpassed. Great job once again! Beautiful as always! Great minds think alike...today I hung silk duponi curtains I found at an estate sale in my master bedroom and with the last two I hung them over the shower (enclosed by ugly glass doors) to cover the not so pretty doors. What a difference this color has made...spring has sprung. I am constantly inspired by you! This shade of blue just perked me up:) Very nice. I'm ready for Spring too! Please don't send your bad weather to Ohio. doing some blog hopping today and am so glad I did. Love what you did here...it is very pretty and unique...just what I need...something new to try!!! With another 2 feet of snow your color choice definitely invites spring to hurry up! To be honest Rosemary, I've never experienced living in snow, so I can't imagine how it feels to be surrounded by it for months. But I know like you I'd be trying to brighten my world up with pretty crafts. 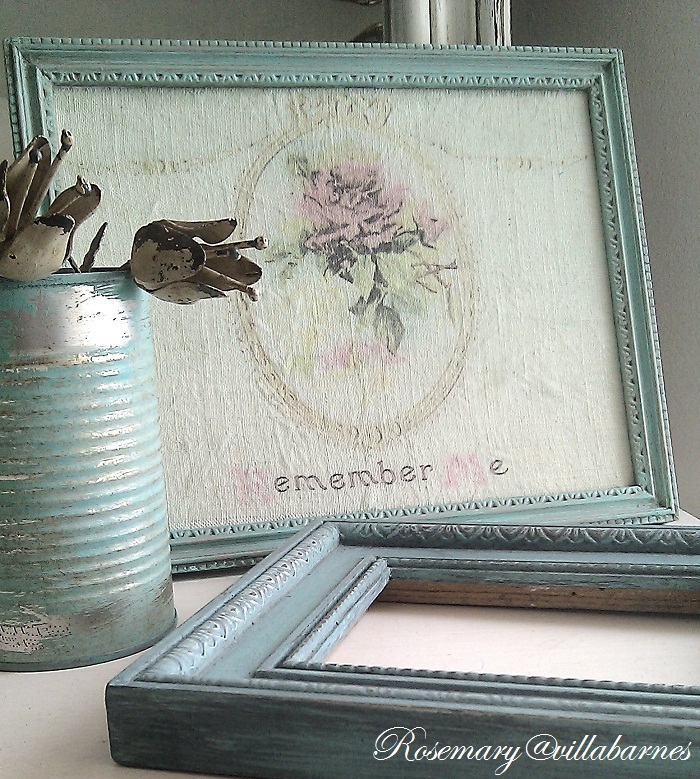 Love the blue hues you've used for these projects. Thanks for linking up at Shabbilicious Friday this week. I'm featuring this post in my Shabbilicious Friday spring touches tomrorrow Rosemary. Crowns, Boards, Christian Dior, etc.